Sometimes you have to grit your teeth and go for it. Les sees how wiring should be done! 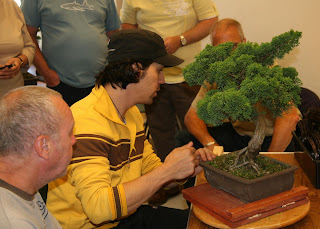 A little curt (bearing in mind my location) but please find above some pictures of an excellent workshop with Marco. 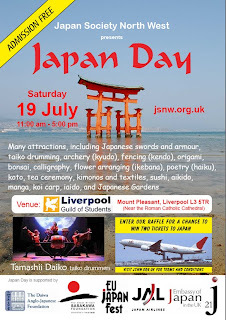 As most of you will know the club has been asked to put on a display for the Japan society's Japan day. 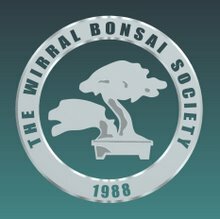 It's going to be a high profile event with many dignitaries attending including the Lord Mayor of Liverpool and the Japanese Ambassador to the UK. Click the link below for more details- whether your showing or visiting. 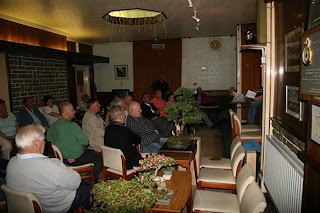 - Andy's talk this month proved both interesting & enlightening. 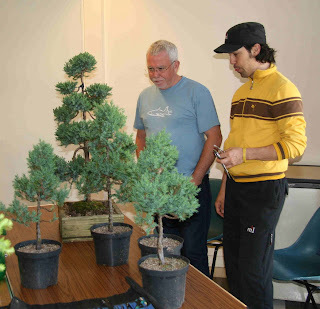 In the 2nd half Andy brought out a large selection of his own accents and discussed where he had acquired the plants from, his growing tips for the species and the choice of accent with tree. 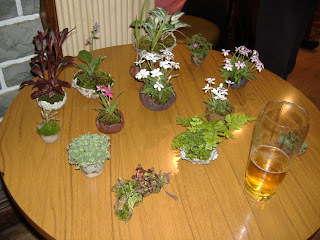 All in all this was an enjoyable night that for me, provided a much needed knowledge boost. 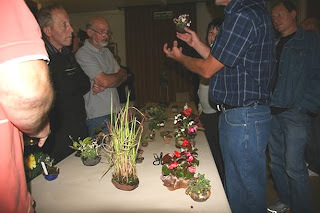 Above are some additional pics from this months meeting, a particularly 'flower' filled meeting, what with Andy's Accents. 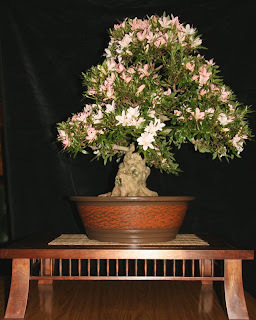 This months TotM was chosen by our Speaker Andy and after due deliberation he chose Dave Y's beautiful Azalea. Dave should have had the honour of polishing the cup for the month but somebody (me) forgot to bring it-apologies. 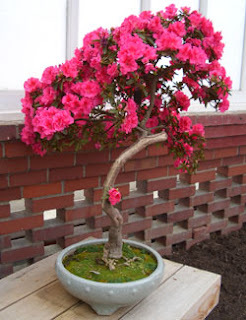 Can any of you poll voters let me in on which flowering bonsai I missed? 'Other' seems to a run away winner at the mo -but nobody wants to say what they are voting for!! 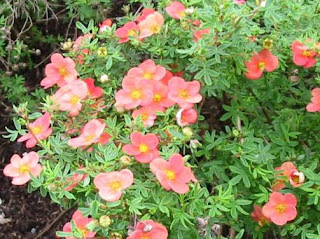 I realise Potentilla was missed off but I didnt think it was that popular! 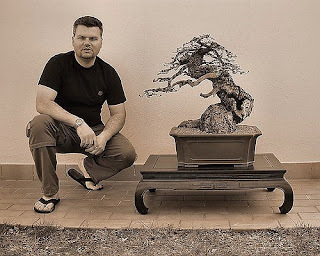 This months speaker is one of our own. 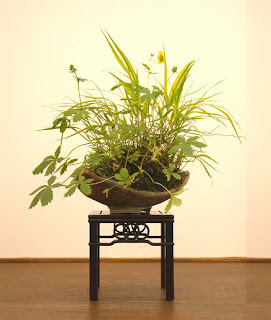 Andy Hardman is to cover a subject close to his heart, the art of the accent plant. 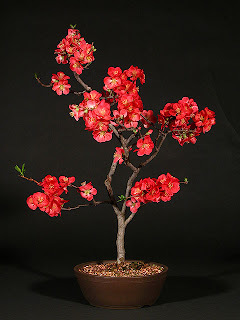 Well known for his love of all things diminutive and flowering, i'm sure Andy will be sharing his passion & divulging all (?) of his trade secrets. 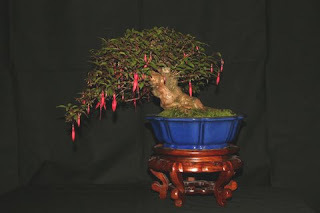 The new poll is up from today (bottom of the blog) and covers the question - what is your favourite flowering bonsai? 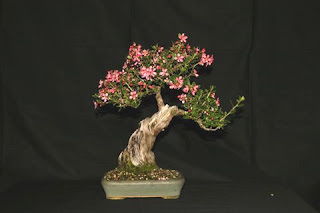 -Escallonia, Fuchsia, Hawthorn, Prunus, Quince, Satsuki Azalea or Other, you chose. 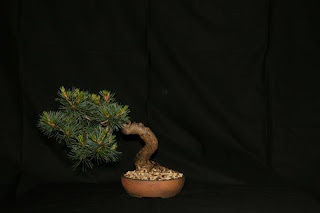 This months site is a personal one run by Giacomo Pappalardo based in Italy. 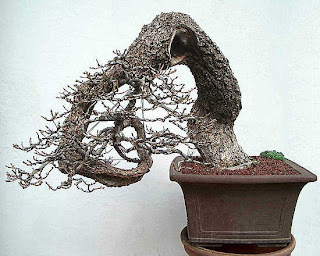 He names his site 'Extreme Bonsai Art' and seems to relish the chance to produce spectacular and sometimes unusual trees.